Grammy-Award 80's heart throb Rick Springfield will be in town on Wednesday to sign copies of his new book. 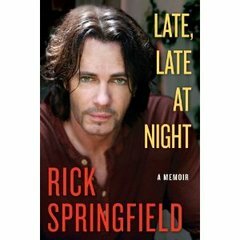 Head over to the Borders on State Street (at Randolph & State) where Rick Springfield will be signing copies of his book Late, Late at Night - a memoir starting at 12:30 on Wednesday October 20. Known best for his 80's hit "Jessie's Girl" and his portrayal of Dr. Noah Drake on General Hospital, but for some he was just a hottie Australian showing off his goodies and that was enough for them. Now, he's written a book and is sharing all of the sordid details of his life with you, including his rise and fall in both the pop music world and acting and his longtime battle with depression. He'll be at the Borders on State Street starting at 12:30, check out all the details here.